HOP HOUSE 13 is a premium-crafted lager from the brewers of Guinness. It is a delicious double-hopped lager made with Irish barley with subtle malty notes and fresh hop aromas. 5% ABV. HOP HOUSE 13 is a distinctive golden lager that is brewed with Guinness yeast, Irish barley and the best of hops from both Australia and USA - Galaxy, Topaz, (AUS) and Mosaic (USA). HOP HOUSE 13 has a sweet fruity aroma, with hints of Apricot and Peach, and subtle malt notes breaking through. It is full flavoured while still being crisp and hoppy (but not bitter) with a refreshing clean finish. HOP HOUSE 13 is best served between 3-5°C. HOP HOUSE 13 is named after Guinness's over 100 year old hop store building at St James's Gate, Dublin where hops are still stored. HOP HOUSE 13 is brewed with the famous Guinness yeast strain using a lower temperature fermentation profile and lager processing techniques. Also, it's double hopped meaning that hops are added at two separate points in the process. 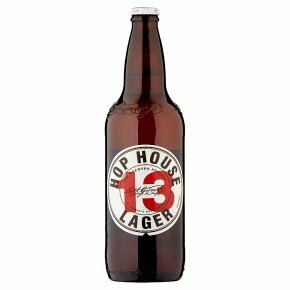 Are you a beer drinker looking for more character and depth from your lager, then Hop House 13 will appeal to you. HOP HOUSE 13 Lager continues the journey that started in September 2014 when GUINNESS celebrated the quality and craft of brewing, with the launch of The Brewer's Project. The Brewer's Project is about a group of enterprising brewers who are on a quest to explore new recipes, reinterpret old ones and collaborate freely to bring exciting beers to life. The new lager became the third release from The Brewer's Project, joining Dublin Porter and West Indies Porter.